Already own a home in the Twin Bridge Estates subdivision? Thinking of selling? Click here and read about current search trends & our web network. 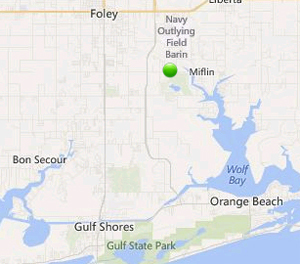 Twin Bridge Estates subdivision is located in Southeast Foley near a small town named Miflin. This rural area of Foley is close to the Foley Beach Expressway and connects I-10 from Orange Beach, AL making travel through these areas much quicker and easier. The expressway joins I-10 around the Wilcox area and comes in to Orange Beach right at the Wharf and amphitheater. Twin Bridge Estates is near the Northern most parts of Wolf Bay and Soldier's Creek golf club is also in the area. If the expressway is used, Mobile, AL and its regional airport are only about an hour away making distant travel fairly easy and relatively traffic-free during the drive. The homes in Twin Bridge Estates are approximately 15 - 20 minutes from the beaches and the Gulf Shores Hangout amongst numerous other area attractions in the Gulf Shores and Orange Beach areas. Please let us know if you would like additional info such as, pictures, subdivision bylaws, recent sales figures by emailing info@condoinvestment.com or call (251) Area-Pro (251-273-2776) for immediate assistance or to schedule appointments to view current listings in Twin Bridge Estates or other properties in the area. Twin Bridge Estates is close to numerous restaurants, shopping venues, and attractions including Glen Lakes golf course right across the street. Just minutes from the Foley Beach Express, the community is a quick 20 minute trip to public beaches and local entertainment. For more information on beach real estate for sale, please visit our Gulf Shores condos and Orange Beach condos pages. We provide the same useful information for real estate along the Florida Panhandle including Perdido Key, FL condos for sale. Use our pre-defined search options, interactive maps, and personalized searches to find the condo that best suits your needs. Easily browse for condos or homes in waterfront or golf course communities. Condos on the Alabama and Florida coast generate sizeable rental revenue and make great investments for buyers looking to earn extra income. We share with our users annual rental revenue information for each condominium making it easier to narrow down your ideal property.